Scientists from Stanford and the SLAC National Accelerator Laboratory have created the world’s tiniest electrical wire. To do this, they used diamondoids, which are the thinnest form of diamonds. The wire is just three atoms wide. These tiny diamonds assemble themselves as Legos. Though diamondoids can’t be used for jewelry, scientists expect that these little wires will be used for a wide range of applications for electricity-generating fabrics, optoelectronic devices, and even superconducting materials with practically no loss. The new assembly method is incredibly precise, and it does not require hands to intervene. Fuzzy white clusters of nanowires on a lab bench, with a penny for scale. At top right, an image made with a scanning electron microscope shows nanowire clusters magnified 10,000 times. Image credit: SLAC National Accelerator Laboratory. “In the study, we have described the formula through which the researchers can construct minuscule and conductive wires of the least possible dimension which in general accumulate themselves”, said Hao Yan, a postdoctoral researcher at Stanford and the lead author of the study. The process to create these tiny electrical wires involves gripping some atoms and getting them together as if they were Legos. Researchers used the smallest possible bits of diamonds. The process starts by adding all the ingredients to the same pot and then adding sulfur to the mix. According to Hao Yan, all it needs to be done is adding everything together and waiting half an hour for the results. This new method allows scientists to have precision without the intervention of hands in the process. Tough they used copper and sulfur in the mix; the technique can be used for more than that. 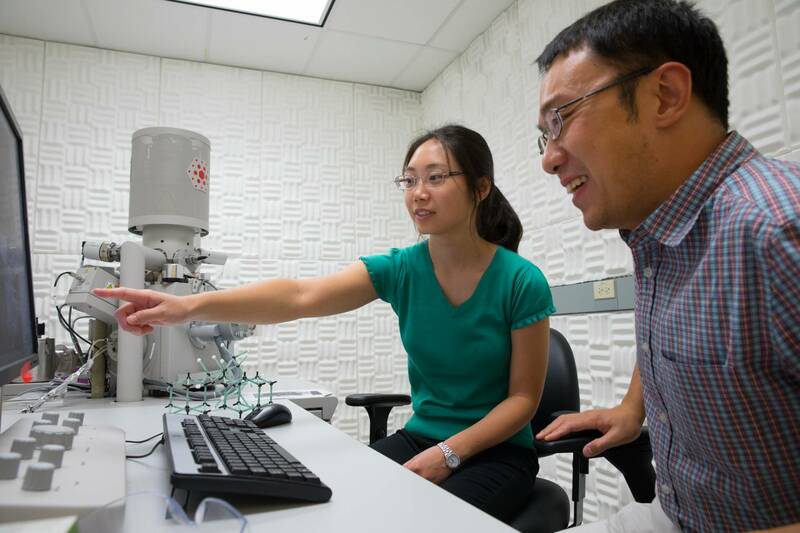 Stanford graduate student Fei Hua Li, left, and postdoctoral researcher Hao Yan in one of the SIMES labs where diamondoids were used to assemble the thinnest possible nanowires. Image credit: SLAC National Accelerator Laboratory. 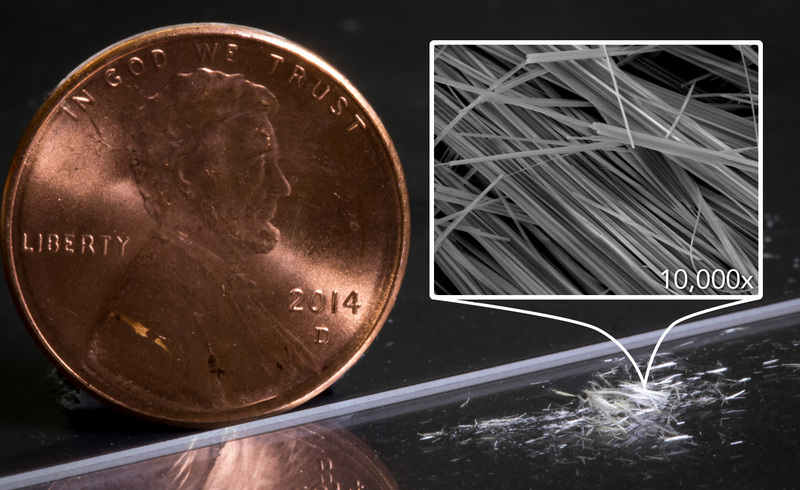 This becomes the world’s tiniest electric wire ever created. Scientists believe it will be used as a technique to construct molecular-scale mesh materials that are used to create even smaller electronics or fabrics that generate electricity. They also said that this invention is going to improve the efficiency of electronics. It carries only a one-directional flow of electrons which is incredibly useful for transistors and other electronics. This method gives versatility to scientists to create new materials with interesting physic and optimal electronic properties. Nanotex, for example, is exploring ways to work with nanowires to monitor the patient’s movement in the hospital bed, to avoid bedsores. “The potential with nanotechnology and nanowires is endless,” said Randy Rubin, CEO of Nanotex, an Emeryville-based fabric innovator, which uses nanotechnology to change the molecular structure of fibers, creating fabrics with stain, soil, odor and wrinkle resistance. Nanowires using cadmium could be helpful in optoelectronics such as light-emitting diodes (LEDs). A zinc-based wire could be useful for piezoelectric energy generators that convert motion into electricity. As well, there are aspects in the nanowires that could also be used to protect the troops. According to Rubin, research in the field is growing, and it keeps getting more and more affordable. Let’s remember that nanotechnology could be defined as the field that learns how to work with small materials in the range of 1 to 100 nanometers. The new report made on these nanowires was published in the Monday’s issue of the journal Nature Materials. Diamondoids are the thinnest form of diamond. They are naturally found in petroleum fluids. These diamond pieces are attracted to each other, and they unite in a way that makes them look like sugar crystals. The diamondoids were drawn to each other using a force known as Van der Waals attraction; this makes it difficult for oil companies because they clump together obstructing the petroleum pipes. ChevronTexaco. Chevron has formed a small company in Emeryville called Molecular Diamond Technologies to develop commercial uses for diamondoids. They are that small, that scientists say that 1 million of them would fit across the diameter of a pinhead. According to Nicholas Melosh, the study co-author and associate professor at the Stanford University, there are 65 gallons filled with these diamondoids at SLAC. The special thing about this little pieces of diamonds is that they are strong and hard, which is necessary for the electric wires. As well, they are drawn toward each other, which restricts the size of the sulfur-copper core. Even if they are visible to the eye when they are attracted to each other, the diamondoids are still far too small for being used in jewelry since they look like powder. Each one of them is less than a billionth of a billionth of a carat. The unit of measurement in the submicroscopic world is the nanometer which is one-billionth of a meter.